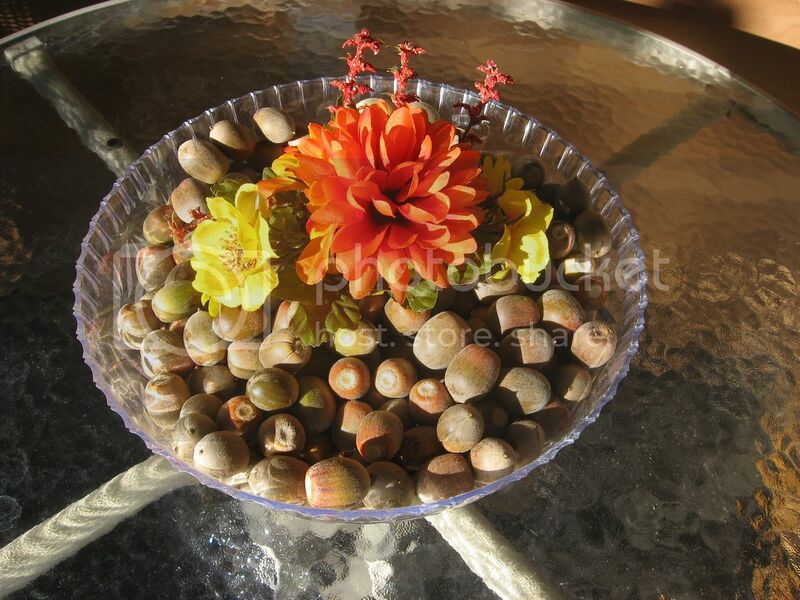 Above: My most recent harvest from the forest…acorns! A lot of people were not happy this week as they experienced LONG delays due to dam construction work. You can avoid the drama if you know that Flatiron Construction will again be paving and flagging today (Friday, November 19, 2010). Delays of up to an hour are anticipated. There are signs warning motorists of the extended delays and I have watched a lot of motorists speed down Highway 38 through Fawnskin to avoid the hassle. Construction crews will be working from 7:30am until about 4:30pm in efforts to avoid delays anticipated by the storm expected to move in this weekend. Their goal it to finish the dam project (Or is it damn project?) before the end of the year. The photo is my collection of acorns…bounty of forest and all that, but the reality of the situation is that there are only a few surviving squirrels to enjoy the tasty morsels and so acorns are everywhere. Sooooo, I decided I should pick up a few in case I wanted to make acorn flour. But after reading this acorn flour effort I am not so keen on the idea. But GG likes the harvesting from the forest idea. Makes me feel like a real mountain woman. Then there are those apples I can’t reach…which might be something to keep me busy for a bit before the next storm. Now around the homestead I’ve been busy but seriously wonder what the heck I’ve accomplished this week (other than make a mess that is). You see I cleaned the carpets since it warmed up. And just before that, I got this notion to clean out the closets. OMG do you know how big a mess you can make doing that? I’ve made a big mess and then put it out on the deck so I could clean the carpets and now, well, the storm is coming so I have to get on it or risk being crushed by boxes that topple down and bury me in the house. In between all these domestic goddess adventures, I’ve sat out on the deck and enjoyed the warmth. I have been amazed at the new grass and growth that is breaking through the soil even as a new storm is on the horizon. Back to my usual routine, GG seriously needs to get out. My big adventure yesterday was when a dog pal showed up on my doorstep. I used it as a good excuse to take breaks and get some dog lovin’ along with training her tricks in between some work online. The downside to all of this is that I did not get out for a good walk–which might be a good thing because I’ve been mighty tired after my strolls. Building back up your strength and stamina is not for sissies. BTW glad that you all noticed that I am out walking again. Lots of people have been commenting on it and I seriously think that you also need more to do if that is the talk of the town! But it is nice to be loved. Finally, I wanted to give you some advance notice on the big turkey dinner and fixin’s next week. Fawnskin residents and Moose Lodge 2085 members are invited over to the lodge for a Thanksgiving dinner compliments of a lot of dedicated Moose Lodge 2085 members and Women of the Moose 359. Usually dinner is in the late afternoon but it is always a great place to head if you want to eat, drink and be merry close to home. Not sure what I am doing yet, being hermit girl and all, but HG is not as snappy as GG, and besides I can come up with a lot more variations using GG than HG. And that, makes me look clever. This entry was posted on Friday, November 19th, 2010 and is filed under Mountain Lake Resort, Small Town Living.